Explora actively introduces travellers to the great scenery of South America, through a well prepared exploration program. Our base is a hotel built for linking man to temporary space and the mysteries of nature. Located 8km from Hanga Roa, on a 9.6km-squared plot of land, unsuitable for agriculture and containing no archaeological remains, Explora Easter Island (Rapa Nui) is located in a privileged located from which to explore the island. 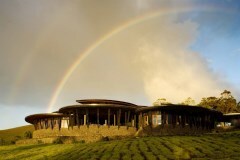 At Explora Easter Island Eco Lodge we offer 18 explorations at different levels. In general, all have strong cultural and archaeological overtones, and are led nu an expert bilingual local guide. All of our guides speak fluent Spanish and English and are very knowledgeable of their surroundings. Every evening in the hotel bar, our guides meet up with guests to program the next day's activities. Our excursions are carried out in groups of more than 8 people. We leave the hotel on foot, walking through the fields and farms that surround the hotel, descending to the coast, viewing various archaeological sites. We finish this tranquil walk at the platform Hanga Te Tenga, where we find Moai that never reached their final destinations. From here we return to the hotel by van. 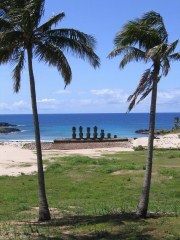 We leave the hotel by van and travel to Hanga Te Tenga, an empty platform where we find Moai that were never raised. Next we walk by Ara O Te Moai, a trail formerly used by the Rapa Nui people to transport the Moai, where we find some statues turned over and others unfinished, now destined to never reach a platform. Then we climb the volcano Rano Rarku to gaze into the crater with its freshwater lagoons, along the way up the slopes appreciating various Moai in different stages of creation. At the end of the tour, we return to the hotel by van. We leave the hotel by van and travel to Tongariki, a platform with 15 intact Moai, a sacred and magical place that evokes great respect for the island's culture. This is the biggest platform, of Ahu, on the island, where we can also find, scattered on the ground, petroglyphs carved in stone. Next, we skirt the coast, taking in the shifting turquoise and deep blue sea, the fishing coves with local villages, and several archaeological sites, including one with a perfectly polished round rock which, thanks to its high iron content causes compasses to behave strangely. Then, we walk to the Ovahe beach, with its reddish sand and crystal clear waters, from where we then return to the hotel by van. We leave the hotel by van and travel to Ahu Akivi, the only place on the island where the Moai are looking towards the sea. We continue by van until we reach the platform Te Peu, where we start on foot, along sheer cliffs with a spectacular view of the Pacific Ocean. Along the way we visit the cave Ana Kakenga, a large tubular cavern formed by flowing lava. We end our trip in Ahu Tahai, in Hanga Roa, where we find unique Moai with eyes made of coral. From here we return to the hotel by van. We leave the hotel by van and travel to Cerro de Pui. Here we begin our hike at the foot of the hill, known for the Haka Pei competition, in which Rapa Nui slide down the hill using toboggans fashioned from banana tree trunks. The trail continues through the fields, passing various archaeological sites before arriving to Ran Raraku, the Moai quarry. From here we return to the hotel by van. We leave the hotel by van and travel to the archaeological site of Papa Vaka, where we can view many petroglyphs preserved in a collection of exposed rocks. We walk through the surrounding fields, observing some examples of traditional agriculture, before ending our hike at Tongariki, the largest Moai platform on the island. We then return to the hotel by van. We leave the hotel by van and travel to the foot of the Terevaka volcano. Next we ascend a small ravine and pass by various archaeological sites. After passing by the crater of Rano Aroi, we arrive to the highest point of the hike, where we can view the eastern side of the island. We then descend to the village of Hanga Roa, the capital of the island, finishing our excursion at the Akivi platform. When finished here, we return to the hotel by van. We leave the hotel by van and travel to the Te Peu platform. From there we walk along a trail bordering steep cliffs. We visit natural lagoons, crossing fields owned by natives of the island, and along the way we can view various archaeological sites, until we reach Anakena beach, a pristine beach of white sand with perfect water temperatures. During the trip we will enjoy a picnic. From here we return to the hotel by van. We leave the hotel by van and travel to Ahu Mahatua. Next we walk downward sloping path along a steep cliff, passing by Maunga Parehe and Maunga Tea-Tea, two small knolls on this area of the island. Along the way, we can see the natural water spring Vai Aheva and after, climb to the top of Maunga Pua Katiki. 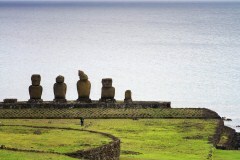 Lastly, we descend to the Tongariki platform to view the fifteen Moai, and then return to the hotel by van. We leave the hotel by van and travel to Vaitea. We begin the hike here, on the estate of the same name, before climbing to Maunga Kuma and the crater of Maunga Terevaka, the highest point on the island. From here we can view the entire island in 360-degree, surrounded by the unending Pacific Ocean. We then follow the path to Anakena along high coastal ridges, slowly descending, passing through various archaeological sites. Finally, we arrive at Anakena beach where you can swim and enjoy the shade of the palm groves. From here, we return to the hotel by van. We leave the hotel by bicycle and travel to Hanga Roa, the capital of the island. We then cross land owned by natives, where we view diverse vegetation such as eucalyptus and ceibo trees. We ride along the edge of Orito Hill overlooking the coastline, feeling the coastal breeze as we descend. Along the way, we discover several ceremonial platforms, such as Hanga Poukura, and the fishing cove Hanga Tee. We then return to the hotel by paved road. We leave the hotel by bicycle, crossing agricultural properties, following a dirt path. We continue down the coastal path, viewing the Motus, small isles located close to the main island, and various archaeological sites, until reaching the Tahira platform. We then continue along paved and dirt road returning to the hotel. We leave the hotel by bicycle, travelling along the coastal road. 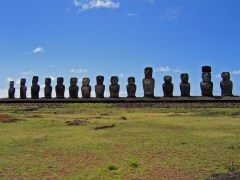 During the first part of the ride we view excellent examples of local agriculture, and then continue to Ahu Tongariki, a platform with 15 intact Moai. Returning by the same road, we stop along the way to swim in a natural lagoon. We leave the hotel by bicycle and travel to the village of Hanga Roa. 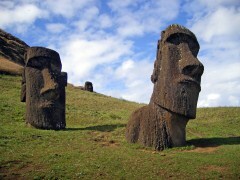 We then take a small dirt road to the platform of the 7 Moai, Ahu Akivi. On our way we view great examples of local cultivation of pineapples, taros and yams. We then continue along the coast, passing the Te Pei platform, then Ahu Tahai, and the village of Hanga Roa. Finally we return to the hotel by paved road. We leave the hotel by van and travel to the coves of Hanga Otai or Hanga Piko. From here we take a boat to sail through coastal caves, take in the cliffs of Rano Kau and view the Motus, small islets famous for the Birdman competition, navigating the crystal clear waters that surround the island. We leave the hotel by van and travel to a local cove. From here we embark on a traditional fishing boat with a local fisherman, who together with our guide will teach us how to fish in the open sea, using traditional island customs. The typical fishing includes tuna, red snapper, and glass eye snapper, which can be cooked on return to the hotel. The waters of Rapa Nui are known for being some of the most pristine waters on the planet, diving in them is a true privilege. We sail aboard a boat to one of the best areas of snorkelling. Explora provides all the proper equipment and a guide to assist in discovering the marine wildlife of the island, such as coral, molluscs, crustaceans, and tropical fish. Enjoy the calmness and peace that is found under the sea here, whose temperature ranges from 20-degrees-celcius to 25-degrees-celcius. 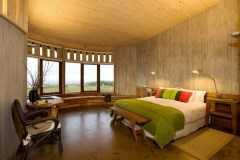 The 30 rooms of Explora Easter Island Eco Lodge are designed to take full advantage of the silence, privacy and spaciousness of the surrounding landscape, ensuring deep rest after a long day of exploration. In order to retreat from everyday life, we must leave the everyday behind. Our rooms are not equipped with wi-fi, TV or minibars. The are 4 Varua suites measuring 44m-squared, all which come with views of the sea. They are all equipped with king beds and have private bathrooms. 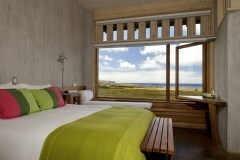 Explora Easter Island Eco Lodge has 26 Raa rooms which measure 32m-squared and come with views of the sea. They also have numerous sitting areas to enjoy the view and relax as well as a king bed and private bathroom. Any items not mentioned as included.